LITEROMTM is centralized online server based college ERP software which is developed with better coding and designing to maintain the speed and efficiency in college administration, academic management and all type of campus operations. Our academic ERP software is made in PHP and MySQL framework and has more than 22 modules for the successful administration of the college and campus activities. All the modules are prepared after the deep pilot survey from various academic institution requirements. LITEROMTM is economic and it is the most popular well renowned college management software in the industry. 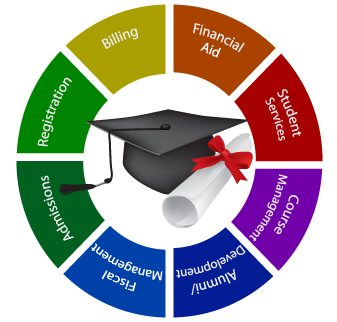 All kind of campus management activities are available in this single cloud based ERP software like - admission date, provisional, domicile, seat type, quota, form no., verification details, photographs, previous academic record, scholarship, internship report, marks & result details, fee details, etc. It is fully integrated with the barcode, RFID, attendance and smartcards. LITEROMTM as campus management software is self-capable to create a paperless and low people interruption oriented environment which is based on the automation and highly data security facilities with the good username and password facilities. LITEROM is also capable to store all kind of information of students from their date of joining to their examination and attendance to the day he/she leaves. Each and every college has their rules and regulations and as per their needs, they can have the need of less or more modules. At LITEROMTM, the customization facility is also available and proper training is also provided to the customer timely. In this academic college ERP software, it helps you in creating the transparency environment between all the departments and the entities of your educational institute. Create unique id for newly and old students and teachers as per their designation and grade. Stores the photographs, previous academic records, marks and result details, scholarship and internship reports. Cloud based all kind of ERP facilities like - SMS alerts facility are present. All the prospective customers using LITEROMTM are very well satisfied with the comfort, compatibility and suitability. This software is available for all type of arts, science, commerce, medical and engineering colleges.